In the last night episode of the TV series “Saath Nibhana Sathiya” it has been shown that Vidya cooks the food for the Suryavanshi family; but the Suryavanshi family is not happy with her style of the cooking and everybody complain that the soup prepares it is the sour . Gaura humiliated Vidya by saying how can a person prepares such a tasteless food. Vidya feels hurts with this and became sad. Now Vidya explain why she unable to prepare good food as she was not well and it is she was feeling vomiting these days. Gaura angrily looks at Durga and told Dharam to call the Daayi Maa in the home. Meanwhile, in the Modi house Pari suddenly started accusing Sona once again; as Pari thinks Sona has snatched her son Tolu from her. Kokila also started blaming by her dialogues; Gopi try to make Pari calm down but all goes in vain. In fact on one hand Pari insulted and yells at Gopi for making his son Tolu’s wedding with Sona on the other hand, Pari told that Gopi and Kokila to follow her instructions in the Modi house. And if they do so it is Pari will be accepting Sona. But Meera says why Daayi Maa we need to call doctor for Vidya as Vidya needs doctor right now not a Daayi Maa. Meera said my sister is not an animal and she call doctor eventually and the doctor confirms that Vidya is pregnant. Gaura became very happy with the news and gifted her a necklace. Gaura out of joy also welcome Kokila and Modi family on the dinner. Kokila firstly says that right now it will be difficult for the Modi family to come in the Suryavanshi family but Gaura insists her by saying great news yet to share with the whole family. Kokila said okay and gives her nod to go there. Now Pari is busy accusing Sona and Sona cries. 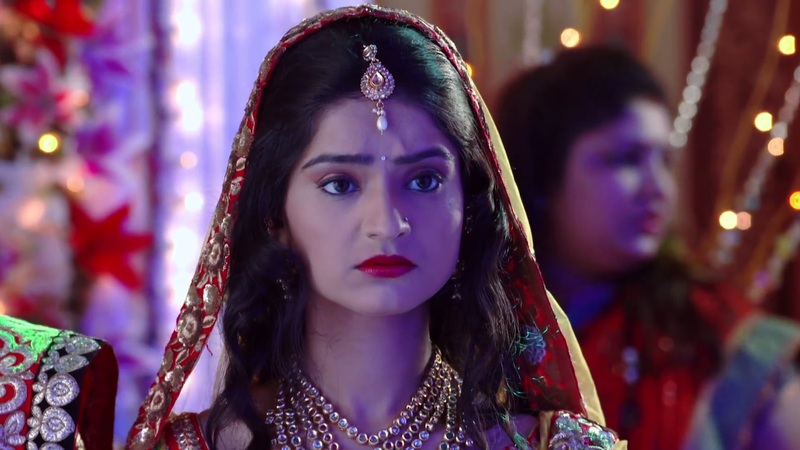 Gopi claims that Sona is perfect daughter in law for her. Pari gives Gopi to give her time till the Puran Massi, that on that occasion Pari will be and she will examine Sona, and if Sona will be fail in the test then she will have to leave the Modi house and she will have to break this marriage of her with Tolu. Gopi became anxious and looked on. Sona became shocked and strange.